And, the best thing about imaginative play is that you need very little, (sometimes, if any) materials at all. Today after reading some books on our flavour of the month, Pirates (! ), we created the simplest Pirate Ship ever that you could also make at home. Imaginative play for children does not need to be fancy... remember, they are using their imagination too! - Extend this activity by making the parts for the ship with your child first. Eg, Make and design a flag, make a telescope, search for something appropriate for an anchor, make a pirate hat etc. Another way we like to paint is with different painting tools on the same picture. It can create a lovely effect while also engaging your child cognitively as they switch between processes. As she picked up each tool (of course she wanted to use each and every one in her design) I can see how she is handling and holding each one and gently show her another way to hold the brush. Teaching her the different control you can get over each tool depending on how it's handled. - Use new language and descriptive words like, "textures" and "implements." This will help with their language development. -Ask questions to help connect their understanding and use vocabulary to give them words to describe what they're creating, eg. "Why did you choose to use that tool first? ", "Which is the next tool you are going to choose? ", "Did the pattern show up well using the glitter paint? Why/why not?" - Use this time to demonstrate particular skills to them that they might be attempting unsuccessfully. For example, how or where they are gripping the paintbrush. How they can avoid big drips of paint on their page etc. In order to further develop fine motor skills as well as working on problem solving and creativity, I rigged up a line between 2 chairs*, hung a couple of pipe cleaners from it and presented my daughter with a bunch of pipe cleaners of her own as an Invitation to Play. *If using in a classroom setting or with children who might pull on the string and drag the chairs down, be sure to affix the line between 2 areas that can't easily move. 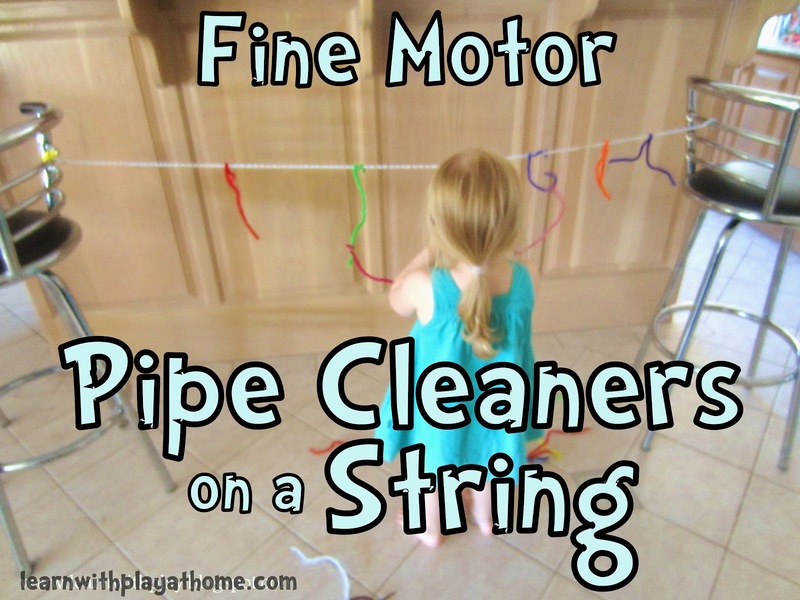 Would you believe this simple idea of hanging Pipe cleaners on a string could keep your little one occupied and learning for ages? Well, in this case, it did. I loved the open-endedness of this activity as well as the room for so much extension and other activities. See "Handy Tips" below the pictures for more ideas. The hardest part for Madeline was when she decided to make a "swing" out of the pipe cleaners. Attaching a pipe cleaner across 2 hanging pipe cleaners presented her with a problem solving challenge and gave her hand eye coordination a good work out. - Use this activity to teach patterns, colours or numbers if you like. Just show/explain your focus to the child and provide the colours or amount of pipe cleaners required. - Have them hang 5 pipe cleaners across and 3 pipe cleaners down etc. Having a special tree in your yard adorned with various exciting and precious items will add that little touch of magic and fun that kids love so much. It's so simple. Just collect any special little items you have at home and then get yourself outside to create some magic. We are actually asking all our family members to find something they can spare for us to hang on the tree. By including other loved ones in the process, it gives our "Magic Tree" even more meaning and makes it even more special. Here are some little bits and pieces that Madeline's Grandma found for her around her house. We will also be keeping our eyes out at op-shops etc and asking other friends and relatives for any trinkets they find that they'd like to give us. We chose the Weeping Cherry Tree in our front garden as our "Magic Tree"
Using materials like these stained glass ornaments means that the tree does not 'shout out' at you. You have to get up close and look carefully to spot all the little decorations. It makes it seem even more special to us. - We are creating a Fairy Garden under the magic tree. You could extend this activity by doing something similar. - Try to use items that will not be affected by the weather. Glass is great for this and if you're worried about anything breakable being smashed, just choose branches up high that can't be reached by little hands and make sure the item is hanging securely.